There is nothing in this world that can’t be improved upon by adding cheese, and grilling. This universal law is at the heart of our Ham and Cheese Royale. 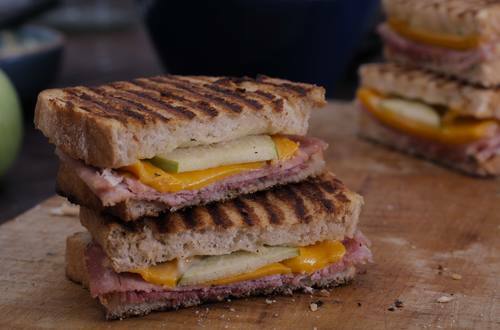 It’s cheddar, apple slices and ham sealed in a grilled exterior of granary bread covered in Hellmann’s Real Mayonnaise. Using Hellmann’s on the outsides of the bread makes for crispier toasties. 1 Combine half the Hellmann's Real Mayonnaise with the chopped thyme in a small bowl, then spread the mayonnaise herb mixture over the slices of bread. 2 Take the ham, cheese and apple slices and evenly spread them on the mayonnaise-covered bread slices, then place the remaining bread slices on top. 3 Spread the remaining 2 tablespoons of Mayonnaise all over the outside of the sandwiches. 4 Preheat the grill, or a non-stick frying pan over a medium-high heat, and grill the sandwiches until golden brown for about three to four minutes.